is create by Monique Vanmeulebrouk. 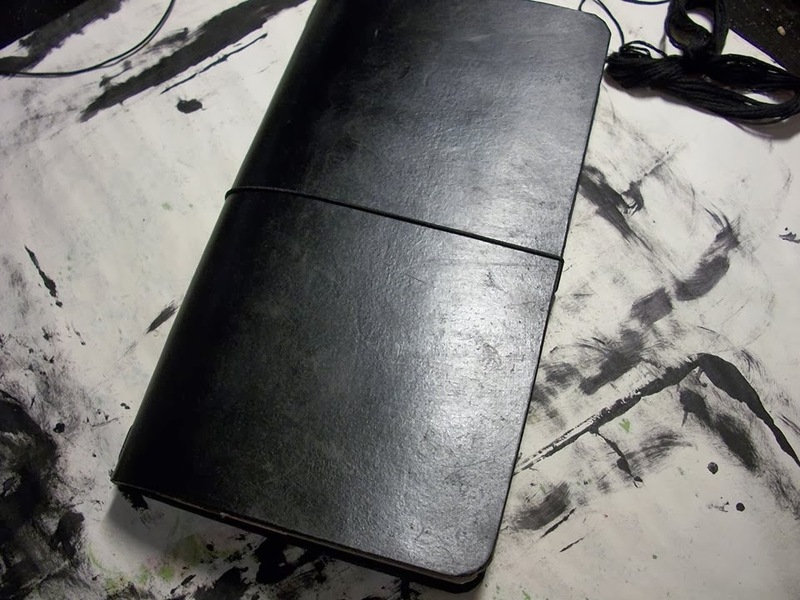 I chanced upon Monique after seeing her post where she showed the wedding anniversary gift she made for her husband - A black Midori-Style Traveler's Notebook. Picture taken from Facebook for readers' view. After seeing this leather notebook, I decided to email Monique to discuss about the opportunity to own one of her leather notebooks. We had a long discussion via emails, about the size of the notebook, the color of the leather, the thickness of the leather, down to the type of notebook refill I wanted. Monique has been very accommodative throughout the process. The Product - A leather cover for 3.5"x5.5" refills. I was impressed by Monique's effort in decorating the package to make it looks attractive. I wanted to ripe off the envelope, but at the same time, I don't want to destroy the effort used to create this envelope (dilemma). To ensure the leather notebook is well-protected, Monique has double-wrap this leather cover. The top layer is a paper-cloth wrapper will give some protection to the leather. After wrapping off this beautiful red wrapper, there's another layer of protection. For this, I know that my leather cover is well protected. Initially, I wanted a red leather cover, but, the color was way-too-loud. Monique has also added a file folder inside the notebook which allows me to keep my loose papers. I have created a file folder for the other notebook of mine, and this is really an useful item to have inside a notebook. I requested for a grid insert (refill) as I find that it is much easier for me to write on grid line. During the planning process, we discussed on what will be the best thickness for the leather if I wanted a stiff notebook. Monique showed me a few samples, and I settled in for something thicker. If I remember correctly, this should be a 3mm leather. There's also a repair kit inside the package - this will certainly be helpful in the event of tear and wear on the elastic bands. A beautiful message card was found inside the envelope - I was too engrossed on the notebook put little attention on what's inside the envelope. For those who are interested to have a closer look on this leather notebook, there's more photos available on Monique's blog post. It has been an enjoyable process working with Monique. She listened my to requests, and customized this leather cover and the notebook refill very much to what I wanted. to discuss on the colors and options. How I use my Word.Notebooks?